If former Bulls figure into your calculations, then you should be rooting for the Blue Jays and the Royals this playoff season. Good luck with that. Two Blue Jays and two Royals spent time in Durham as they were coming up to the major leagues. And one ex-Bull is over in the National League. David Price of the Toronto Blue Jays spent some time here as a 22-23 year-old as he was coming up through the Rays system. But not very much time—just 4 games in 2008 (18 innings) and 8 games in 2009. Stats. Toronto catcher Dioner Navarro only spent part of one season (2010) with the Bulls. Stats. This Bulls fans remembers him mostly for him taking a 102 mph hit-by-pitch from Aroldis Chapman. Video here. Wade Davis, now a reliever/closer for the Royals spent a lot of both 2008 and 2009 with the Bulls, all as a starter. Stats. As an example, here’s a mention of him from a game back in 2009. Ben Zobrist, the durable and very talented ballplayer now with the Royals, had playing time with the Bulls in 2006, 2007, and a rehab stint in 2008. Stats. You could make a good argument that the Rays would have been much better off this year if they’d figured out a way to keep him. Jason Hammel is the only ex-Bull on the National League side, pitching for the Chicago Cubs. Back in 2005-2007 he was with the Bulls pitching to catcher Kevin Cash, the Rays current manager. Stats. 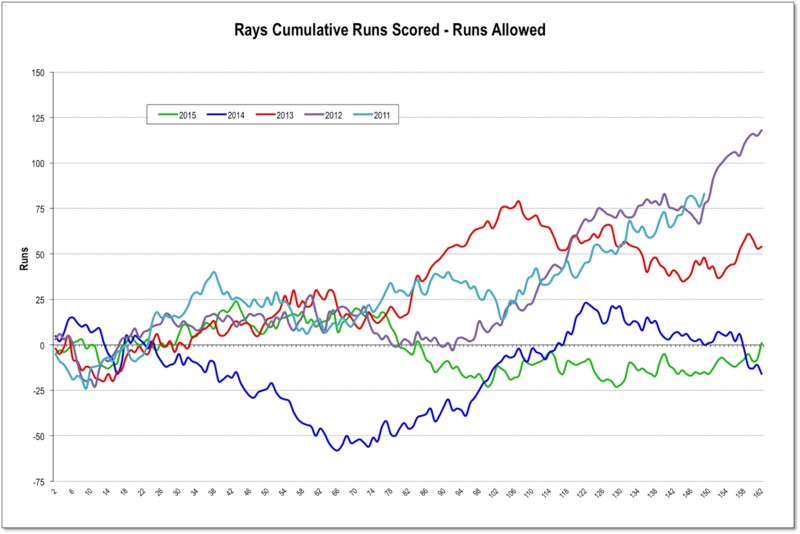 Just for grins, I keep a few charts about the Durham Bulls’ parent club, the Tampa Bay Rays. 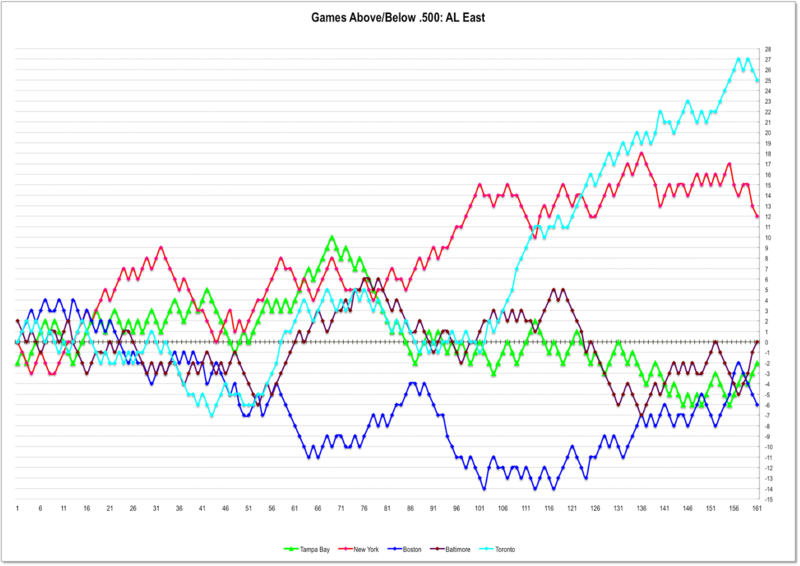 The first is simply the wins and losses over the season, plotted as games above or below .500. 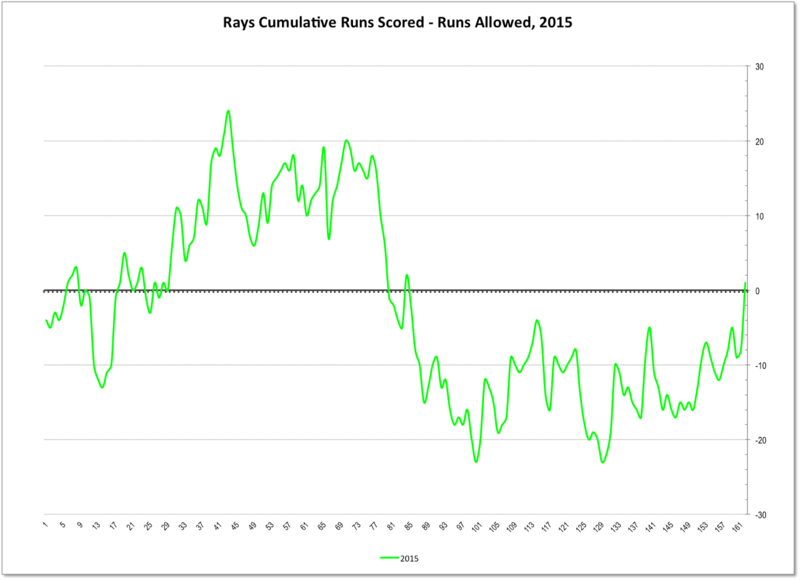 As can be seen, back around game 70 in early June the Rays peaked at 10 games above .500. 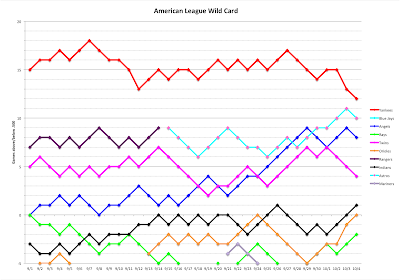 They were at a season low of 6 games below .500 as recently as September 27th. And they wrapped things up in 4th place. Note: click on a chart for a larger image. 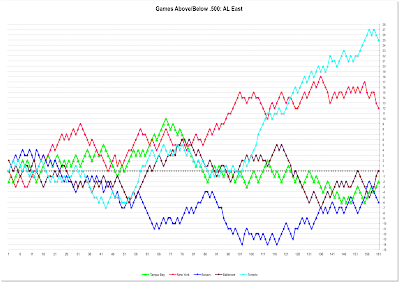 One reason why they finished in 4th is that, oddly enough, their opponents scored more runs than they did. 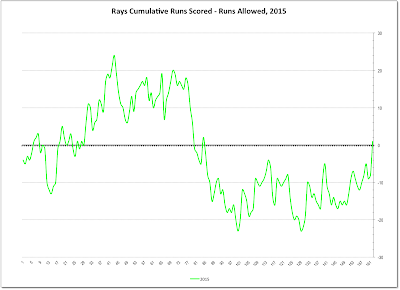 This chart is a running total of the net runs scored minus runs allowed for the year. As can be seen they just barely crept back to a midpoint. How does this compare to previous years? Here’s the last five. 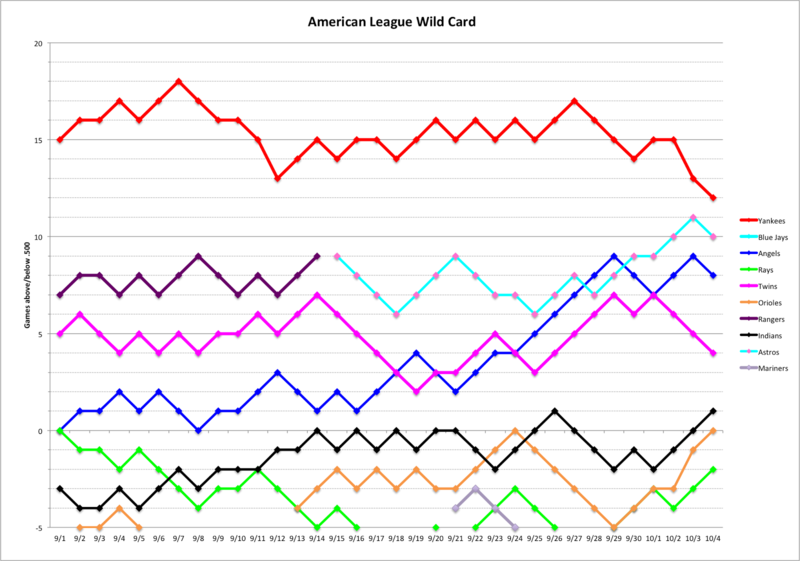 Not quite as bad as last year, but not nearly as good as the previous three years when they made the playoffs either outright or through a wild card slot. 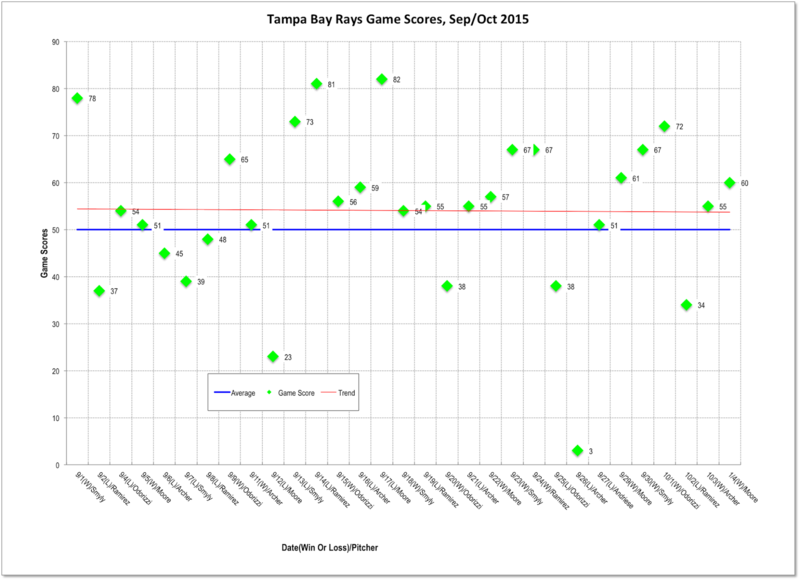 I got intrigued with the “game score” stat this year and tracked the Rays starting pitchers. Game score is sort of “quality start” with a few twists. Here’s a couple of charts that came out of those data. 50 is “average” and for the last several weeks of the season clearly the starters as a group were above average. However, the Rays only won half the games. 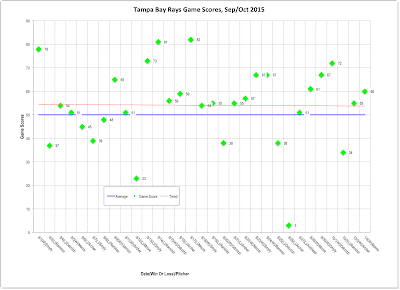 Conclusion: starting pitching is really important, but the Rays bullpen and hitters just have not been up to par. 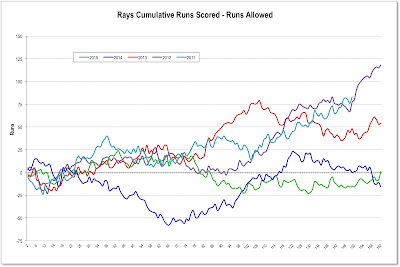 The last chart has little to do with the Rays, but back on September 1st it seemed that the Rays had at least a remote chance to go after a wild card slot. Here’s how that played out.